Experienced in antique funiture repair and other fine furniture repair. Re-gluing furniture that has dried out or is loose. matching and blending color and grain as close as possible. Cabinetry modification of existing cabinets to accept new appliances. Repair work is usually labor intensive. 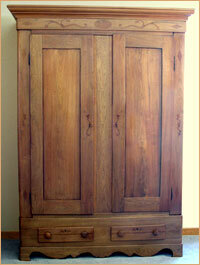 "We restored this antique walnut armoire. It was discovered by an advertisement for old walnut lumber. We purchased this in over 50 loose pieces."